Surface Solutions Offers the Best Value in PVD Coatings! Not all PVD coatings are the same, what separates Surface Solutions from the others? Ever notice that a coating from one vendor always seems to work well, while coating from another vendor works well sometimes, but at other times it doesn’t work at all? If that’s happened to you, it’s most likely due to the second vendor not being consistent in how they coat tools. Since most of you probably don’t know what to look for in choosing a coating vendor, we put this page together to educate customers on why we think our coating service is one of the best values available. There are lots of factors that affect how well a coated tool will perform. We’ve listed some of the more common ones here. 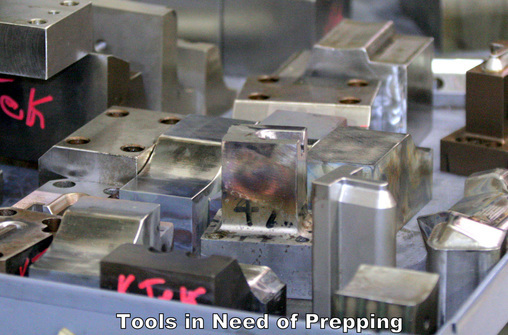 Type of Process – We use a cathodic arc process to coat tools. Cathodic arc is a very robust process that produces high levels of metal ionization. High metal ionization produces good coating adhesion to the substrate. Due to the high level of metal ionization, cathodic arc coatings typically have wide operating windows, meaning one can deposit very good coatings with a wide variety of process parameters. Other processes, such as sputtering or ion plating, are not as robust and have smaller operating windows, making it more difficult to consistently produce a good coating. Coatings Tailored to the Application – Some coatings work better for a particular application. We discuss applications with our customers to ensure the best coatings for that particular application. Using the least expensive coating doesn’t always result in the best value for the customer. Coating Thickness Optimized for the Application – Since coatings are applied to reduce friction and wear, it stands to reason that if the coating is a little thicker, it will take longer to wear off and will last longer. The problem with putting coatings on too thick is that coatings are brittle and at some point, they will chip off. We optimize our coating processes to apply the maximum thickness, without having the coating chip off. ​Cleaning Processes Chosen Based on Contaminants Present – One size doesn’t fit all when cleaning tools for PVD coatings. Some contaminants have to be removed with glass bead blasting, other tools require diamond polishing. The trick is to use the minimum amount of abrasive cleaning to get the tool clean, while limiting any edge radiusing or surface roughening. Better Finishes Perform Better – We polish a lot of tools to improve finishes, ensure good coating adhesion and optimize coating performance. See pictures above. 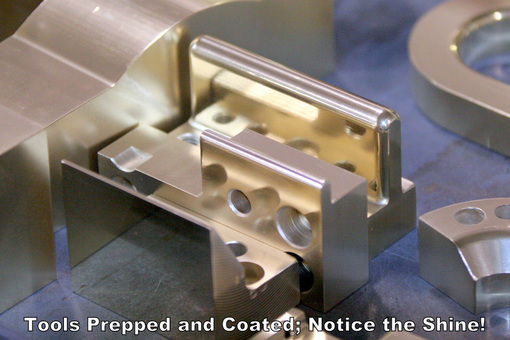 Parts Positioned in Best Areas of Vacuum Chamber – PVD coatings are a modified line-of-sight process. The best coatings go onto areas of a part that are in a direct line-of-sight with the vapor source. We design our own equipment and fixturing to ensure that parts we coat are held in the optimal areas of the vacuum chamber. Vacuum Chamber Not Overloaded with Parts and Fixturing – Trying to coat too many parts at a time, or having fixturing that is bulky and takes up a lot of space results in a large gas load (outgassing) at the start of the coating cycle that can have an adverse effect on coating quality. Vacuum Chambers Clean and Have Little Coating Buildup – Similarly to the item above, if coating is allowed to build up on the chamber walls, it can have an adverse effect on pumpdown rates and coating quality. Process Temperature – Most PVD processes take place at 800°F, or higher. Some vendors claim to be able to coat at lower temperatures (about 400°F), but trying to keep the temperature down usually has some adverse effects on quality. Likewise, if a temperature gets too high, one runs the risk of going above the draw temperature of the tool steel and softening or distorting the tool.